Grease 3 cookie sheets. Turn dough onto well-floured surface; gently knead about 5 minutes or until smooth and elastic. Divide dough into 3 equal parts. Roll one part into rectangle, 15x9 inches. Place rectangle on cookie sheet. Heat oven to 375°F. Bake 20 to 25 minutes or until golden brown. Drizzle Glaze over warm coffee cakes. 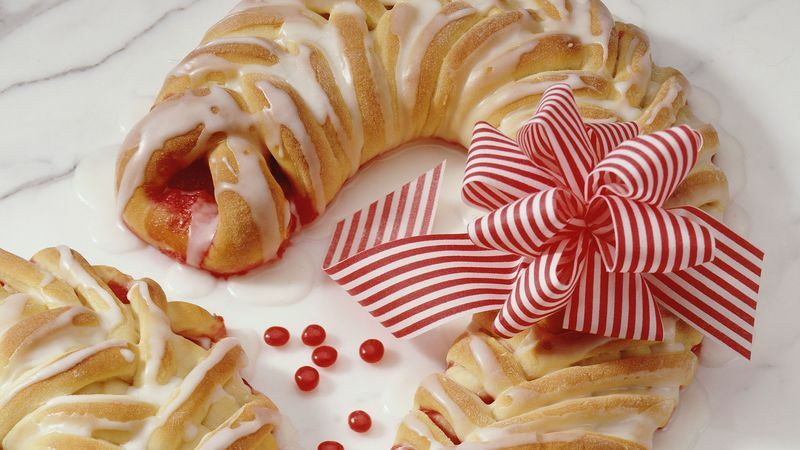 Decorate with cinnamon candies. Use holiday cellophane found in party stores to wrap the homemade specialties you plan to place beneath someone’s Christmas tree. Jingle bells attached to bright ribbons can tie up the package. To keep dried fruit from sticking to your chopping knife, rub the sides of the blade with a little vegetable oil.